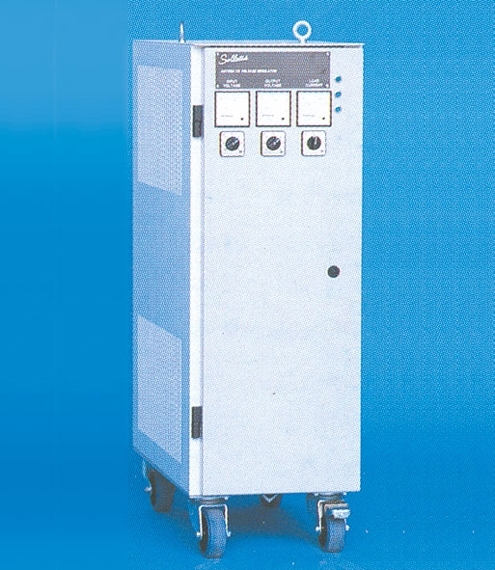 A main power voltage stabilizer is used to improve the quality of the 230 / 400 V power supply used in offices or workshops. Large variation in the main electrical power supply could damage all the items connected to it (computers, photocopier, motor, machines, etc..). The capacity of a voltage regulator is given in VA - Volt / Ampere. This value could be calculated from the power consumed in Watt divided by the power factor. While the power factor is equal to one in case of resisting load (heating resistance for example), appliance such as motor or fluorescent lamp degrade this power factor to a lower value (0.7 for example). This impact the voltage regulator which has to be dimensioned to a larger value. It is also possible to correct the power factor using network capacitors. It is recommended to ask a certified electrician to evaluate the requirements for the voltage regulator power and the optional correction measure. Line conditioners are an improved version of voltage stabilizer, adding filtering, surge reduction and limit the effect of disturbance on the protected elements. This improve version is the recommended model. While these types of voltage regulator are sufficient in most cases, large variations of frequency in the main supply could also lead to problems on some of the appliances connected. In such a case an inverter solution could be investigated (see inverter).